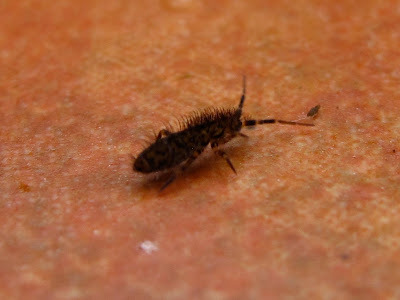 Pottering around in the conservatory the other day I noticed a large springtail walking on the floor. When I say 'large' of course, it is in relative terms as the animal was around half a centimetre long. Springtails, or Collembolans are small wingless hexapods less than 1 centimetre in length, some - one of the smallest insects- less than half a millimetre. Due to their small size they often remain unnoticed, until they jump. And jump they can: springtails can cover many times (I have read up to 20 times) their own length in a fraction of a second. Their name gives away the mechanism they use to jump. They have a prolongation of their abdomen (a forked 'tail' or furcula) which is normally folded under the insect and secured in place with a 'catch'. On being disturbed, the springtail releases the catch and the 'tail' pushes fast against the substrate, catapulting the springtail into the air away from danger. My conservatory springtail proved easy to identify thanks to a very exhuberant mane by WAB member Jason Green as Orchesella villosa. 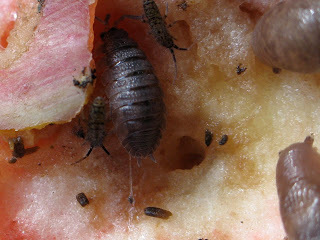 Going back to old photos I found one where a couple of individuals of the same species enjoy the underside of a fallen apple with some slugs and woodlice like a group of friends that have found paradise. Many resources on springtails state that their relationships with insects is unclear, as some research showed they might be more related to crustaceans. To clarify this debate, a recent paper by Regier and collaborators, based on a phylogeny of 62 genes showed conclusively that collembolans are indeed hexapods and more closely related to insects. A very informative account on Collembollans by Steve Hopkin here. Regier, J.C. et al. (2010) Arthropod relationships revealed by phylogenomic analysis of nuclear protein-coding sequences. Nature, 463:1079-1083. here.